On April 10th, 2011, Jon completed his second half marathon. He finished 22nd out of 1134 runners (not too shabby!) in 1 hour, 29 minutes and 4 seconds. It got us talking about participating in the Wine Country Half Marathon that is held in the Willamette Valley in the fall. We talked about it before, and frankly, I was a little nervous about participating, because this one has a maximum time. All runners and walkers have to finish within 3.5 hours. Back when we talked about it, I had never done a half marathon, and 3.5 hours is pretty intimidating for a first time half marathon walker. However, since we first talked about it, I completed my first half marathon and I did it in 3 hours, 6 minutes – I jogged some and walked most of it. So, we renewed our discussion of it this last weekend, because this half marathon sounds pretty cool. At the end of the half marathon, they have wine tasting! That’s way better than the standard cold food and awards ceremony. I’m sure not everyone feels that way, but hey, I can totally go for that. And in the meantime, life goes on. We got home last night to discover that the stove exhaust vent is dripping water. After calling the handyman and climbing up on the ladder to stare at the roof and confirm that the cover to the vent hadn’t just blown off in one of the many rain/windstorms we’ve had lately, it became evident that this would require the absolute dreaded “housecall”. So, we’ll soon be finding out if this is something major, or minor. I’m hoping that it is solidly in the minor category, considering that I just had the roof replaced 5 years ago – when they tore off the entire roof and replaced it. Hopefully we can replace a bit of flashing, and we’re on our way. But, one never knows. In other expensive news, my sweet 24 year old horse is having dental surgery next week. Now, I know what you are thinking, “horses don’t get wisdom teeth, do they?” And no, they don’t. But Biz never comes down with any sort of normal disease or ailment, so instead, keeping with tradition, he has developed a sort of osteoporosis of the teeth. It is officially called EOTRH, which is short for Equine Odontoclastic Tooth Resorption and Hypercementosis Disease. Don’t worry, I had never heard of this before either. It basically means that his teeth are breaking down at the root level, getting spongy inside, and to combat that problem, his body is also building up extra cartilage on the roots, creating a spongy tooth root with painful growths of cartilage. It makes sense when you look at the x-ray, trust me. Now, you are probably asking, “What sort of insane person would just up and decide to get x-rays on her horse’s teeth?” Yeah, well…. It all started when Biz somehow sheared off a piece of one of his canine teeth. So, he has this little pink exposed area on the tooth that frankly looks quite painful. So we had the vet out in the fall to look at that. He originally thought it was something called a pulp granuloma (I hadn’t heard of that one either), and he wanted to x-ray it to figure out if there was any sort of infection in the root of the tooth, or inflammation below the gumline that would indicate any infection. Oddly enough, when the x-rays were viewed and reviewed and tooth extraction was decided upon, it ended up that the canine tooth isn’t the big problem. So, the canine was the instigator, so to speak, causing all sorts of problems for all his spongy incisors who were just trying to mind their own business. But quite simply, the trip to the vet clinic to have his first tooth extracted will be extremely nerve-wracking (for both of us, I’m sure), and will cost me an arm (not a leg though… YET…). I have owned Biz for 21 years, and I worry about him. And, this will be the first of many tooth extractions, because they have no cure for this disease, and the sponginess just keeps marching along in the other teeth when you pull one tooth. The vets don’t really know how quickly this can happen, because it varies in each horse, but when you compare the x-rays they did 6 months ago to the ones that were done last month, you can easily see that the disease is progressing. And so, just like that, the travel fund gets diverted, yet again…. SIGH…. P.S. Since I wrote this post, it stopped raining, and the leak in the stove exhaust vent turned out to be a weird fluke caused by the direction of the wind, and the velocity of the rain, the exact lining up of the moon with the rings of saturn, and maybe a witch’s curse thrown in for good measure. In other words, the contractor thinks I’m a nut, but at least I’m not out a couple hundred bucks. The other night, Jon, Jon’s mom and I split a bottle of the Chehalem Ian’s Reserve Riesling. We got our wine club shipment from Chehalem a couple of weeks ago, and this was included in the package. We had sampled the Riesling before, but I’m not sure that we had ever had the Reserve Riesling. Wow. It is a nice crisp apple Riesling, sweet but not overly sugary, a nice balance that Jon and I both enjoyed. I had mine with clam strips and chips, and to be honest, I started out with a bottle of beer, thinking that the wine would be too sweet for the food. However, when I had a glass of the Riesling, it was a great accompaniment to the vinegar on the fish and chips. It offset the tartness of the vinegar nicely. Jon had his with a grilled halibut topped with avocado. Linda drank hers with Chow Mein (can you tell we got takeout?) Anyway, my point is, the Riesling went well with all three dishes, and we were quite pleased with it. The only thing that could have made it better would have been a nice sunny day with dinner on the patio. Of course, I’ve given up on this spring giving me any warmth at all. The other night, Jon and I decided to open a bottle of the Michael Florentino Couniose. Michael Florentino has a tasting room in Woodinville and we visited last September. I was drawn to the Couniose because it is a varietal that you hardly ever see – in fact I hadn’t heard of it before that day. This wine is delicious! It is a fairly strong, heavy red wine, but has enough fruit to balance it out. I guess it could be described as jammy, but in a good way. So often when you hear the word “jammy” lately, critics are using it to describe a wine that is all fruit with no structure. I love a big fruity wine with structure, and this one delivers. It doesn’t have the heavy oak that so frequently turns me off in a red wine. I would certainly return to this wine again, but you never know with the specialty varietals if the winemaker will make them a second year. Let’s hope they do. Time to leave Arizona Already? Our last day in Arizona, we had to fly out at 5 pm, so we needed to be at the airport and have the car turned in by about 3:00. We checked out of the hotel and headed a little south of Tucson to the Mission San Xavier del Bac. 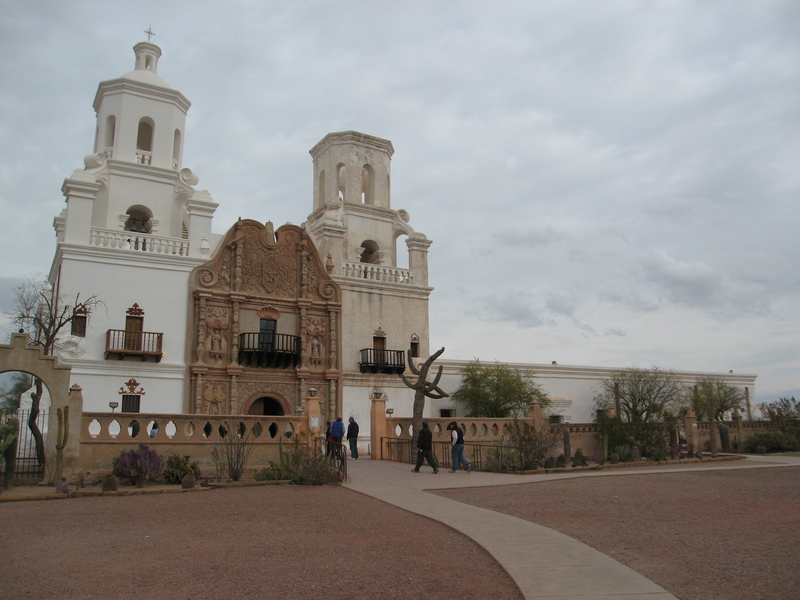 The Mission was originally founded in 1692 by Eusebio Francisco Kino, the same guy who founded the Mission at Tubac. The current church was built between 1783 and 1797, using mostly native labor and artists. The church was built under the direction of Franciscan Fathers Juan Bautista Velderrain and Juan Bautista Llorenz in the Moorish style, but the architects are unknown. I had seen the outside of the mission before, but Jon has never been. This time we visited the inside of the church, and it is amazing – the frescoes and carving inside the church are absolutely beautiful. A restoration process on the inside is outgoing, so there was scaffolding up and painters working in areas of the church. Keep in mind that this is still an active parish, and the building is still being used for worship. When you go, you will see that one of the towers remains unfinished. Apparently there are a couple of myths that explain why, but there likely isn’t any truth to either. The first myth is that the tax laws of the time exempted buildings that were under construction, and the other surrounds a belief that the tower would remain unfinished until “The Excellent Builder” came to finish it. I guess it will remain a mystery. After the Mission San Xavier del Bac, we began the hour and a half drive back to Mesa, stopping on the way at the Casa Grande ruins. Casa Grande National Monument is in Coolidge, just northeast of the town of Casa Grande. 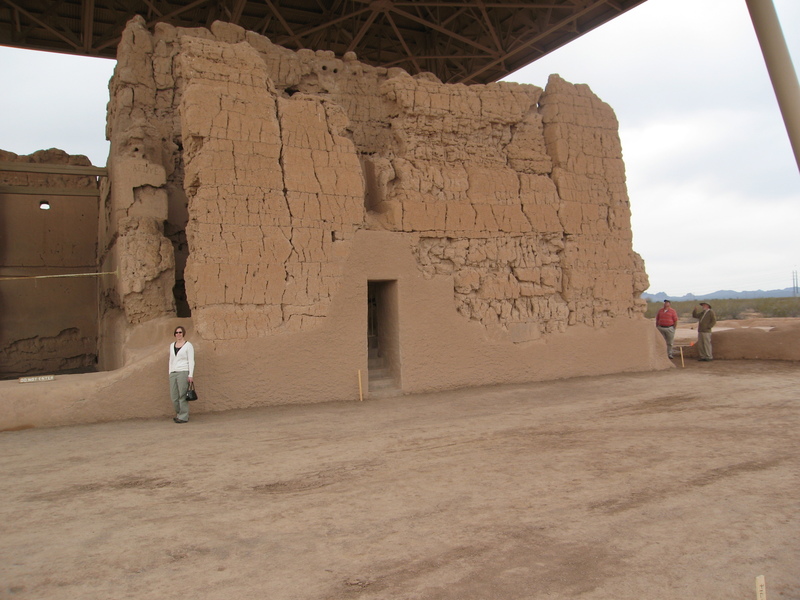 The Casa Grande (big house) was built in the 13th century by the Hohokam Indians who farmed extensively in the area. 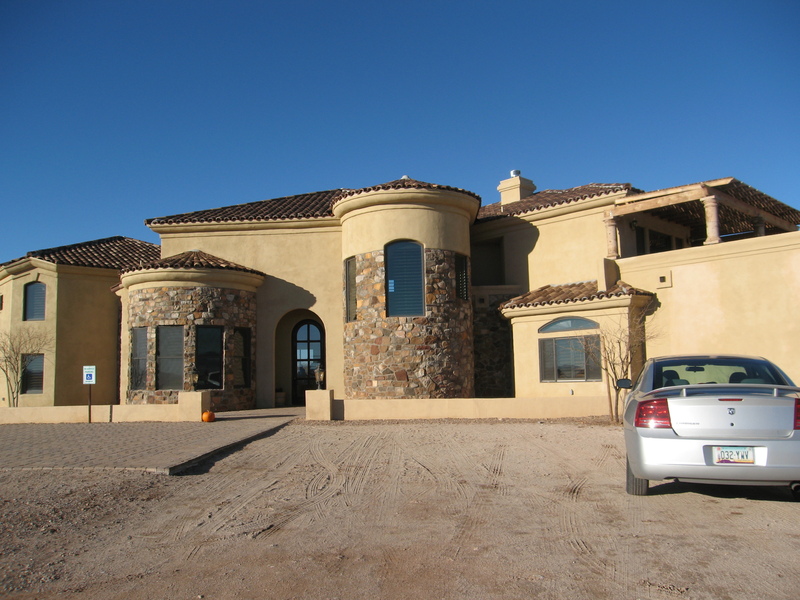 The house is built of caliche, and at 4 stories tall, is visible from a long distance away. The Hohokam built an entire complex of adobe houses around it, and it was surrounded by a defensive wall. They also built an extensive irrigation system to farm the land, bringing in water from miles away, and evidence has been found that the Hohokam maintained extensive trade networks. No one knows what the purpose of the Casa Grande was, since it does not appear to have been used for communal living, but it was abandoned around 1450 A.D. It has stood against the elements since that time. Since 1932, it has been a bit better protected against the elements by a large roof covering the entire structure (it makes it look a little bit like an alien invasion). When you go, you will be awestruck at how large the Casa Grande is, especially since it was built entirely of clay. They didn’t have reinforced steel back then! The National Park Service museum there gives information about the Hohokam people, and what they know about the Casa Grande. It is certainly worth a visit. And just like that, we were wrapping up another amazing trip and heading home. It always make me a little sad to go back to the airport and wait for my flight home, knowing that I have to go back to the grind. But, it is worth it, just for those few days of fun. The next day we decided to do something a little different and go over to the Desert Museum. The Desert Museum has outdoor exhibits featuring the local flora and fauna of the desert. Once you get inside the museum, you basically walk right back out into the desert. The cacti are labeled, but obviously the king of the desert here is the Saguaro cactus. If you can’t identify a Saguaro without a label, you have got a big problem. Then there are birds and coyotes and javelinas, which are like a desert pig. They have an exhibit area with a family of javelinas, which makes it easy to see them when ordinarily they would be hiding during the day. The coyote was hiding though, so we didn’t get to see him. We didn’t see any rattlesnakes either, but Jon was ok with that. They did have a collection of Zuni fetishes in the museum store that were reasonably priced, and some Indian baskets and ceramics, which were much more expensive. After we went to the Desert Museum, we decided to go hiking nearby in the Saguaro National Park. 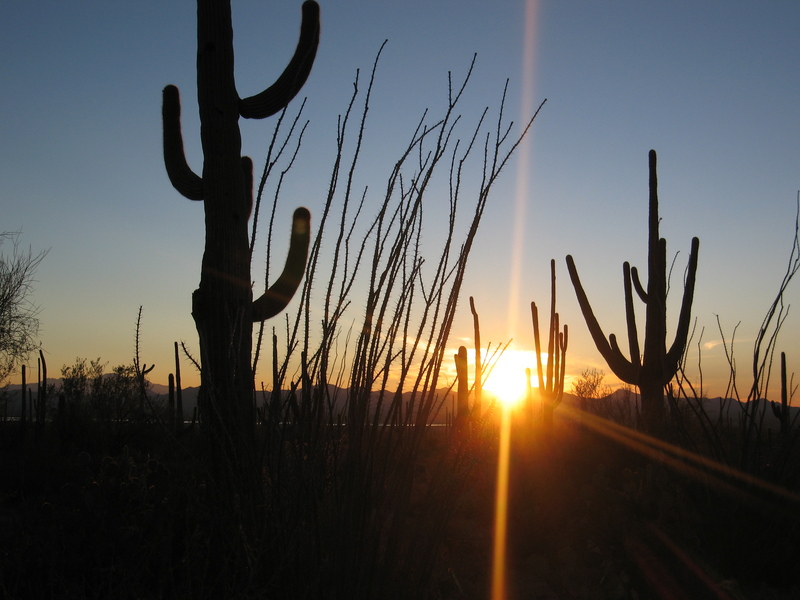 For those of you who haven’t been there, Saguaro National Park has two sides, east and west. They are located on either side of Tucson, and have quite different topography. In sum it up succinctly, Saguaro National Park East has more saguaros. We went there first, and visited the visitor’s center to get a map of the area and some of the trails that we should go on. We found some suitable trails and headed out. We had a great time – the trails were relatively easy for us, but they gave some great close-ups of saguaros, and some really nice views as well. Of course, Jon being the klutz that he is, brushed up against a cactus and got a bunch of spines stuck in his leg. He wasn’t hurt, and honestly, I tried not to laugh. We also found a short hike that takes you up to some ancient petroglyphs. They are difficult to photograph without a serious zoom lens, but really neat to see. We watched the sunset, and I got some great photos, and we found that it gets quite cold in Arizona in January after the sun goes down. But it sure is pretty. That evening, we were cruising around looking for a decent place to eat, and we passed by a steakhouse and wine bar called the Elle Wine Country Bistro that from the outside looked pretty pricey. And it was. But, you could sit in the bar and order from the bar menu and the prices were actually pretty decent. And there, I discovered Albariño. Albariño is a Spanish varietal that is gradually increasing in popularity here. It is a light white, with a crisp mineral taste. It has a hint of citrus, but is not overly fruity – very refreshing. I ordered that for myself and when Jon tried it, he kept wanting to steal sips for himself. I had a PoBoy sandwich or something along those lines, and it was absolutely delicious – Jon had the pound of steamed mussels, which were also excellent. Next time we are in the area, I’ll certainly head back there. The next day, we did Saguaro National Park West. This is the side that has fewer Saguaros, and more in the way of scrub brush. It is still beautiful, but different. In this area we went hiking and enjoyed the warmth – it was the first day I could wear shorts and a tank top and still feel warm. An older gentlemen asked us if we would like him to take our photo, and after he took the photo he gave us a pen and told us that Jesus loves us. I’m not sure what happened to that pen! We did have a good hike though, and after our hike we headed into downtown Tucson to check out the sights there. We parked and found our way to Old Tucson, which is a little tourist area in a complex of 19th century adobe buildings. And in the middle, there is a courtyard where you can sit and have a beer with your lunch. Again, I had the opportunity to be baked in warmth, a phenomena that is sorely lacking during the northwest winters at home. As a matter of fact, right now I’m really missing that. We poked around the shops, looking at Navajo ceramic pots, Zuni fetishes (theirs were much more expensive than the ones at the museum), paintings and framed photographs, and we decided to buy a little Navajo pot with a turquoise embellishment and burned horse hair decoration. It’s a neat technique really, where you take a piece of horse hair and you burn it against the pot. It leaves a zig-zaggy line across the surface of the pot. That little pot is sitting on our china buffet at home, reminding me of a great trip. Then we went to the Tucson Art Museum. They had an exhibit on Ansel Adams photographs that I really wanted to see. His photos are really something – the way he captures the light and shows the contrast between light and dark, all with black and white film. He really had a talent, and was adventurous enough to go to the spot where you could get the great photo that others couldn’t get. They also had a neat exhibit on antique furniture, mostly Asian, but European and American as well. I can imagine all the cool furnishings I could decorate my house with, if only I had that kind of cash. That evening, we went to a concert at the Hotel Congress in downtown Tucson. Jon found out that The Girls were playing at show with $10 tickets, so he booked them online before we flew out for vacation. The Hotel Congress was once one of the ritzy hotels in Tucson, and it has been restored. It is now a boho place, focusing on the the younger eclectic crowd and booking popular bands. Of course, if you stay there, you might as well go see the band, because you won’t be sleeping upstairs. The show was good, and we enjoyed ourselves. Of course, we were up way past our bedtime, and I was pooped by the time we got home. Tubac, You Say? – Never Heard of It! 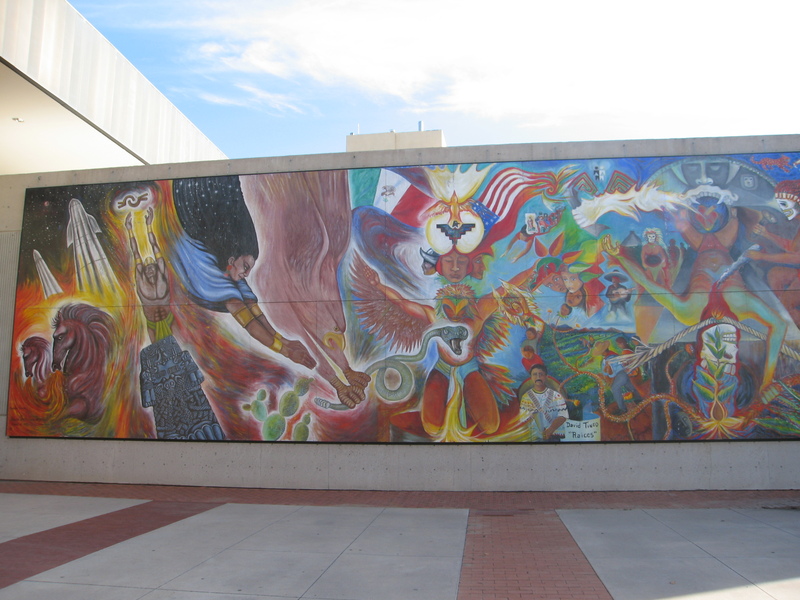 In January 2010, Jon and I took a trip down to Tucson, Arizona for 4 days. Anyone who lives in the northwest understands that winters here get dreary, and at some point, it becomes necessary to save oneself and escape to someplace sunny and dry. We flew down on a Saturday, and got to Mesa as the sun was beginning to set. We got our rental car quickly because we didn’t have to wait for checked bags, and were soon on the road headed south to Tucson. My parents had gotten us a GPS for Christmas the month before, and we brought it along, thinking this would be a great time to try it out and get a lot of use out of it. The GPS came with two cords, one to plug into the car, and one to plug into the computer to download new maps. Of course, I only brought the one to plug into the car, and of course, I brought the wrong one…. Oops. Live and learn, and never forget how to read an actual, paper road map. Luckily, I had brought one along. Our GPS had enough battery life to get us to Tucson, but then we had to rely on those good old map reading skills that we were taught in school. Wait – we didn’t learn that in school? Where did we learn how to read road maps? On the way, we ate dinner in a chain restaurant that I had never heard of called Mimi’s Cafe. It has a New Orleans Jazz theme, and it was actually pretty good. We enjoyed ourselves, and the wait there was 10 times shorter than the Olive Garden. And it was a good thing we stopped when we did, because if I had gotten much hungrier, hostages could have been taken. So, after my tummy was full and my nerves were soothed, we continued our trek down I-10 to the Comfort Inn. Our Comfort Inn was just a couple of miles outside of downtown Tucson, and conveniently located to the things that we wanted to see and do. The one drawback was that there wasn’t much in the way of food right near there. The hotel had a continental breakfast, so we had one meal out of the way each day. But they did have a clean comfortable room with cable, and that night after settling down, we discovered Pawn Stars. If you haven’t heard of Pawn Stars, it is the guilty pleasure for anyone who likes antique stores, history, estate sales, or Antiques Roadshow, combined with the absurb reality of people in Las Vegas pawning their treasures to get gambling money (they never say that’s why they want the money, but I’m convinced that 90% of them will head right into the casino with their cash). Jon and I were transfixed. When we got home, we discovered that my mom already knew all about Pawn Stars, and she didn’t tell us! Oh well, I guess we only get so much with basic cable – the world continues without us. The next morning, fresh faced from watching Pawn Stars early into the morning, we got up and decided to head down to Tubac. Tubac is a artist community, i.e. tourist trap about 30 minutes north of the Mexican border. It is a sleepy little village with art galleries and shops galore, and a couple of restaurants. If you don’t want to do any shopping, this is probably not the place for you. We poked around there for awhile, marveling at all the handmade furniture, oriental carpets, and beautiful paintings that we can’t afford. We did buy a little matching pottery spoonrest and sponge holder to take home with us. There is a furniture maker there who uses burled wood and wood with various knots and imperfections, and then fills the knots with crushed turquoise and seals it in. The result is a table with streaks of turquoise running randomly across the top or side of the piece. It is absolutely beautiful, and one day, maybe I will have one. We had lunch in a Mexican cantina restaurant called Old Tubac Inn, with the best salsa. The food was good, and went well with a cold Corona. It would have gone a little better with the beer if the restaurant hadn’t been quite so cold though. After lunch we headed over to see El Presidio de San Ignacio Tubac, which is now a state park and historic site. Tubac has a long and colorful history – it was first settled by non-natives in 1691, by Jesuit missionary Father Francisco Eusebio Kino, who set about building farms and missions and converting the natives. By 1751, the Pima Indians were tired of being dominated and revolted, destroying the Tubac settlement in the process. When they were defeated in 1752, the Presidio de San Ignacio de Tubac was built and garrisoned with 50 troops, to prevent further revolt. Captain Juan Bautista de Anza II was stationed here from 1760 until 1776, and during this period, he led two overland expeditions to California, the second of which resulted in the founding of San Francisco. The mission was moved to Tucson in 1776, and it fell into ghost town status until the Spaniards reactivated it in 1787. It was a stop on the route of the overland ‘49ers, who lured away most of the residents. When the US finally purchased the area in 1853, Tubac was a ghost town again. A mining company was established in 1856, bringing new life to the area, but only until it busted in 1860. Tubac was seized by Confederate troops during the Civil War, but only until the Union got it back a few months later. Apache Indians periodically raided the site from the 1750’s all the way through the 1860’s so there was never much peace and quiet in Tubac. Geronimo finally surrendered in 1866. The current town site was established in 1882, and seems to have been a sleepy village ever since. The artist community was created in 1948, when artist Dale Nichols formed the Artist’s School. The Presidio site became a state park in 1959. Who knew a tiny little artist town could have seen so much? The site is a mix of ruins and buildings that have been preserved from the 18th and 19th centuries. It is certainly worth a visit, and we even watched the cheesy video at the museum (they really need to update it). After touring the museum and the grounds at El Presidio de San Ignacio Tubac, there wasn’t really anything else to do in Tubac, so we headed towards home. We knew that there were wineries in the area, so we decided to take a detour on the way home through Sonoita. We didn’t have the whole afternoon, but we gave it a go and found Kief-Joshua Winery. Arizona’s wineries use mostly grapes from California, because the plantings in Arizona are relatively new. I imagine that as the industry grows, they will begin to use more Arizona-grown grapes. Kief-Joshua is an elaborate house, with slate floors and a large tasting room that look like it was accommodate a fairly large special event. That said, the tasting bar itself wasn’t very big, and curved around in a way that made it tough to fit more than about 4 people. The server was a young guy who seemed to know quite a bit about their wines, and we started off with a Chenin Blanc that I wish I could get in Washington. It was nice, crisp and fruity, perfect for a hot summer day spent in the sun. I still remember it fondly, and hey, if any of you are going to be in Elgin, Arizona anytime soon, could you pick me up a bottle? The rest of their wines were ok, but nothing to write home about. They have a neat logo on their glasses of a gnarled old grapevine though. We only had time for one more winery, and it was open until 6, so the guy at Kief-Joshua suggested we head over to Wilhelm Family Vineyards. The winemaker served us herself and it was obvious she took great pride in her wines. The atmosphere in the tasting room was friendly and comfortable, and we talked to a Hispanic woman who told us that the way to make a great guacamole is to add feta cheese. She’s right, it does give it that something different (we should do that again sometime soon.) Jon and I both liked Wilhelm’s Zinfandel. She also had an herbed wine concoction called Gluhwein, a German traditional drink, where you added a mix to wine. It was pretty good, but I wasn’t sure we would ever drink our wine like that. Before we left, she signed our bottle of Zinfandel for us (unfortunately, it was a felt tip marker, and it got a bit smudgy). So, we headed back towards our home away from home with a couple bottles of wine to drink over the next few days of our trip. And with that, we headed home to enjoy our wine.